AP Police SI 707 Posts Notification 2016 released. Apply Online for AP Police SI 707 Posts at www.recruitment.appolice.gov.in. Sub Inspectors of Police (Civil) Men & Women Jobs Notification 2016 AP State Police Civil SI 707 Posts Online application at www.appolice.gov.in. 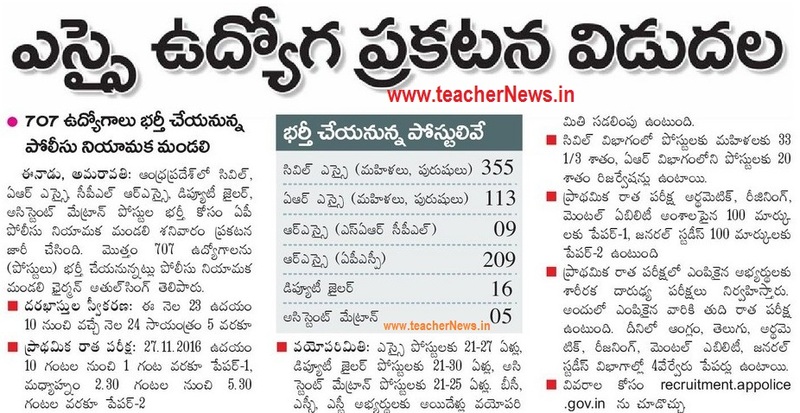 AP SI Posts zone wise vacancies and District wise vacancies list. AP Police Sub Inspectors Posts Online Application, District wise vacancies, Syllabus and Exam Pattern, Fee Particulars, Age limit, Selection Process, Salary, Last date apply, Hall tickets, Physical Measurement Test Details, AP Police SI Posts Preliminary/ Final Written Test Model Papers and More Details Below Shown. Who are Eligible and Interested Candidates Online Apply to AP Police SI 707 Posts at www.recruitment.appolice.gov.in. AP Police Sub Inspectors Posts Vacancies list of Zone wise and District wise Nellore District, Prakasam District, Chittoor District , Anantapur District, Kadapa District, Kurnool District, Krishna District , Guntur District, East Godavari District, West Godavai Distric, Srikakulam District, Vizianagaram District and Visakhapatnam District. OC / BC Candidates Rs.600/- and SC / ST people Rs.300/- fees payment MeeSeva /AP Online / E seva / TS Online centers after get Journal Number .